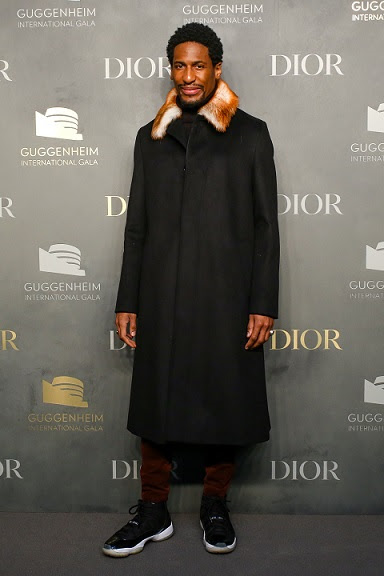 Renowned jazz musician, The Late Show with Stephen Colbert bandleader and Music Director of The Atlantic, Jon Batiste wore a Dior Homme black wool and cashmere coat with white Tuscan lamb collar at the Guggenheim International Gala Pre-Party presented by Dior last night in New York City. Rebecca Hall, Kate Mara, Michelle Monaghan, Portia Doubleday, Makenzie Leigh, Shameik Moore, Margarita Levieva, Sasha Pivovarova, Mamoudou Athie and more came out for the party, which draws the young and budding-into-fame to the museum ahead of the proper, black-tie gala the following night. Guests were also treated to a performance by HAIM and DJ Set by Kindness.